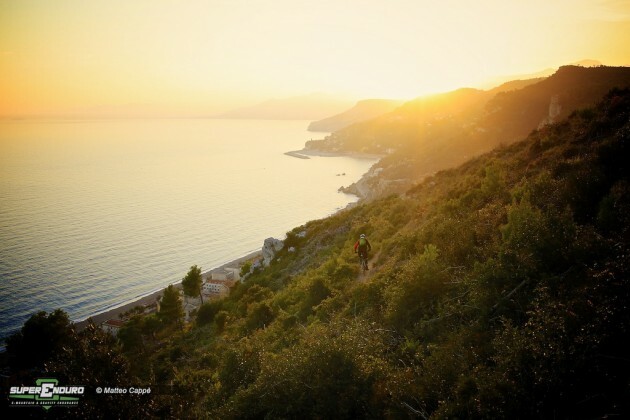 The Enduro World Series will crown its new world champions this weekend – and all that stands between the riders and glory is the incredible trails of Finale Ligure, Italy. The Italian Riviera resort is one of the most popular and iconic riding destinations in Europe, but anyone who thinks they know what to expect from this weekend's course is mistaken: four of the six stages are on brand new trails created specifically for the race. Event organizers have managed to not only build new trails, but also breathe new life back into two classics that haven't been raced in years. The result is 95 kilometers of fresh trails, descending a total of 2,300 meters, and stages that are entirely pedal powered with no uplift. Through beech forests, limestone, thick vegetation and loose rock, riders will encounter a huge variety of terrain as they make their way down to the warm waters of the Mediterranean. And although the 500 riders taking part will be following routes first carved out by their ancestors in 3,000 B.C., their thoughts will very much be focused on the race at hand as they look to make their mark on the last round of the season. In the men's race Jared Graves (Yeti/Fox Shox Factory Team) has a comfortable lead in the overall – he only needs to finish in the top 23 to secure the World Champion title. But all it takes is one mechanical or mistake, and his nearest rivals Damien Oton (Devinci/Alltricks.com) and Justin Leov (Trek Factory Racing Enduro Team) could still steal the victory from him. Also in the mix this weekend are Fabien Barel (Canyon Factory Enduro Team) and reigning World Champion Jerome Clementz (Cannondale OverMountain), both of whom have missed the last five rounds due to injury. 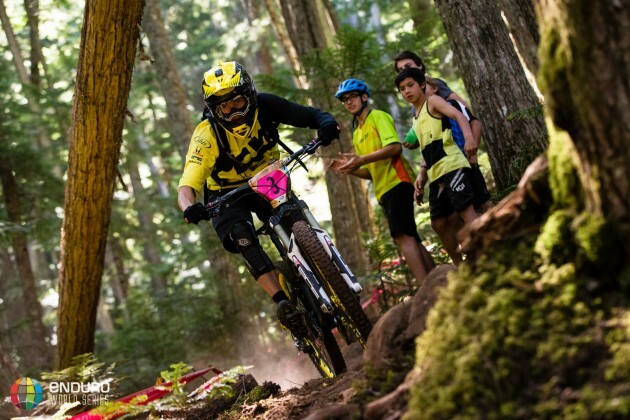 Clementz took the win at the first round of the EWS season in Chile, before falling victim to a serious injury. As with every race this year, the points battle between Anne-Caroline Chausson (Ibis) and Tracy Moseley (Trek Factory Racing Enduro Team) in the women's competition rages on. Tracy sits ahead of Anne by a mere 80 points – a win from either lady this weekend would hand them the overall title. But Cecile Ravanel (GT Pulse Session) will be feeling strong after winning the last round in Whistler, and is still very much a contender for the overall. Anneke Beerten (Specialized Racing Team) has also enjoyed some podium time this year and will be hungry to finish her season back up on top. Anne-Caroline Chausson on stage 1 at Whistler. In the junior race it's Sebastien Claquet (Giant France) who's out in front, with Robin Matot (Yeti Belgium – Urge bp) just 100 points behind in second and Ireland's Conor Lavelle (Team Biking.ie) in third. In the Master's Primoz Strancar (Orbea Geax MTB Team) is way out in front and has the title in the bag, but the race for second and third place is tight with just 30 points separating Mika Kangas (Kampin Kanuunat) and Emmanuel Abate (Cercle Des Passionnes). Enrico Guala, of Superenduro and Enduro World Series, said: "Finale has an incredible mix of elements, making it one of the best destinations in the Mediterranean: the climate, food, services and accommodation, but most of all an incredible territory keeps feeding the local trail building community with new trails and fresh lines. Chris Ball, Enduro World Series Managing Director, added: "It's hard to believe we're at the end of our second season already, but what an incredible year it's been. The level of racing just gets higher and higher, and I can't wait to see what the riders make of these amazing new trails in Finale. Seeing Tracy and Jerome named World Champions here last year was such a highlight, so it seems fitting we return here to find our new 2014 champions."